Your goal for this competition is to map something historical. Now, 'historical' is a pretty broad term so we'll limit it to stuff before 1990: most of you probably weren't alive before then, and if you were, well...go take your pills, grandpa. Aside from that restriction, we're leaving it fairly open: it could be historical in a video game context, a world event context or heck, even an alternate history (provided you actually have a fantastic backstory: don't take this as an excuse to flimsily work in a map you've already done). We're definitely looking for creativity and originality here, so crack open those history books and get mapping! We've opened this competition to both engines. The entries will be judged separately. Please read the restrictions below carefully. You have a month to complete this competition, which will not, in any circumstances, be extended. I'd sort of forgotten how difficult it is doing these competitions. Every one of them I've judged, I've had to make some pretty close calls with regards to the final placement. This competition was, naturally, no exception. While we only received a handful of entries, picking the top three was a real challenge. However, after numerous, nearly fatal punchups with Penguinboy, we narrowed it down to three. I surely hope it's worth the massive amount of blood I lost in those fights. A note: because we only received a few entries, we changed the competition type from Goldsource and Source judged seperately to judged together. 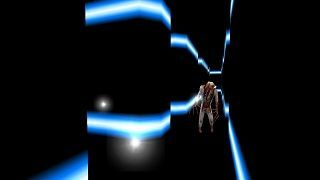 Skals hit the ground running with a nice entry for the original Counter-Strike. Despite the fact that Skals' map went up against the Source engine, it more than stood its own in portraying a small village of ruins by the ocean, with some nicely detailed brush work and effective use of prop models. While there are a few gameplay flaws in it (a lack of clip in certain places results in players getting stuck in the geometry), it's a fun little map if you're after a bit of a run around in the now somewhat ancient game. A well deserved first place. Next up is JeffMOD's unnamed Source mod (side note: seriously guys, give your maps some interesting names next time!). What impressed us the most about this entry was that JeffMOD had gone through and written up a great little piece of alternate history fiction to along with his mod. He had also taken the liberty of adding in some weapon reskins, which is some great dedication for a competition and what clenched this entry through to a winning position. A short development time has obviously resulted in some sacrifices being made to most aspects of this mod, but with a bit of planning and some more cooking time in the oven, this could be something to look out for. I personally loved this one. It was nice to see someone thinking broadly on the competition theme, even if the end result is rather simplistic. As the readme states though, 'hopefully this is good for at least a few minutes of fun', which it most certainly is. It's a fun, charming and well put together map, with a cute twist at the end. It was my favourite of the bunch! As I mentioned earlier, it was a struggle to place the top three. Everytime I look at the top three, I'm tempted to rearrange them and throw in one of the following. By far, the best looking map of the group. Doodle has certainly improved his mapping skills over time with this Left 4 Dead 2 flavoured survival map, but it's let down by, unfortunately, presentation issues, most of which I know should not be in maps done by those with his current abilities. Having said that, this map was so very close to getting a place in the top three, but in the end, we thought that the winners better portrayed the theme of the competition. Well worth taking a look though, particularly if you're a fan of Left 4 Dead. Another map close to placing, but missed out for the same reason that doodle's did as well. Beach Party is inspired by the infamous D-Day landing at Normandy during World War 2. However, this map has been given a Half-Life makeover, with Barney taking the place of the Allies and the Marines taking the place of the Germans. One thing I do have to mention about this map is that it's hard. Real hard. Cruelly hard. Make sure you read the readme before you head in and don't feel bad if ye olde God mode comes a-callin': Penguinboy and I both had to use it. I believe I can summarise this map in a single, onomatopoeic word. 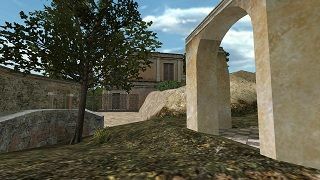 The only other map that purports to take the player back in time, Blitzkrieg's map features a collection of smouldering, destroyed buildings surrounding a central, parthenon-esque structure. 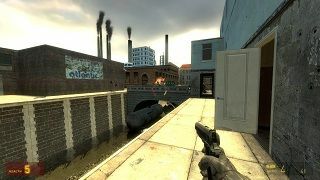 This is a simple, PvP, Counter-Strike: Source map that, while scoring high in imagination, is let down by a lack of polish. Well, that's it folks. The next competition should be up soon and we think you're going to love it. If not, we're seriously going to have to cry ourselves to sleep every night till it's over. Processed in an offensively colossal 277 nanoseconds.